New York, NY, June 14, 2010. Antigua and Barbuda’s Dame Yvonne Maginley DCN, CMG, OBE, OD was awarded the Caribbean Tourism Organization’s prestigious Lifetime Achievement Award on Friday, June 11th, at the 37th Annual Governments of the Caribbean State Ball and Awards Presentation held at the Plaza Hotel in New York City. Dame Yvonne was recognized by the Caribbean Tourism Organization (CTO) for her outstanding contribution to the development of tourism in the Caribbean. This prestigious award is bestowed on high performance individuals who have truly made a difference in the Region by empowering individuals and providing a legacy for future generations. 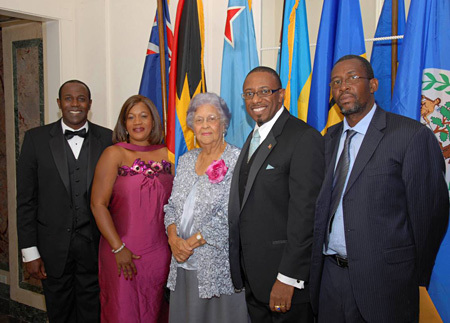 Dame Yvonne was nominated by the Antigua and Barbuda Tourism Authority and was selected by a panel of independent judges from a list of very outstanding, accomplished and distinguished nominees. A short video, which included a congratulatory message from Antigua and Barbuda’s Prime Minister, The Rt. Hon. Baldwin Spencer, introduced Dame Maginley to the hundreds of Caribbean dignitaries, industry partners, media representatives and stakeholders in the region, who were attending the ball. In accepting the award, Dame Maginley spoke of her pride in Antigua and Barbuda and her belief in the potential of the tourism industry as an economic platform for the islands of Antigua and Barbuda and the wider Caribbean. Ms. Derede Samuel-Whitllock, Director/USA, and her team from the North American office of the Antigua and Barbuda Tourism Authority were also present at the Caribbean celebration.